This is our 4th Generation Flag Bag. 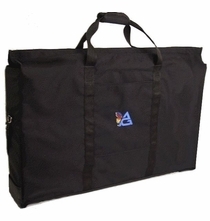 Still constructed of 1000 denier black Cordura, the zippered closure had been replaced with a "Hook & Loop" closure which allows the top of the bag to be opened completely ensuring easy access to the contents. 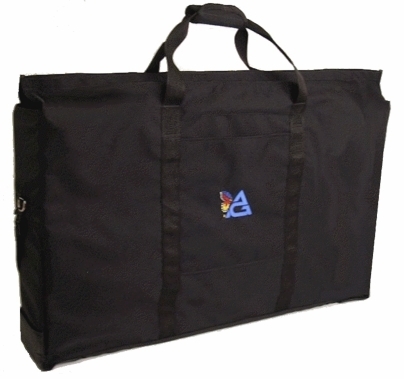 Each bag can hold anywhere from 8 to 12 Flags & Scrims, depending on the manufacturer of the frames. 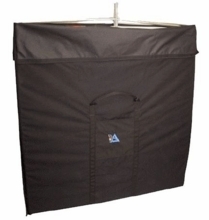 In addition, the bottom edges of the bag have a "wear pad" which is held onto the bag with "Hook & Loop" to protect the bottom from wearing out. "Wear Pads" can easily be replaced when worn or lost. Outside Dimensions: 44 1/2" x 25" x 41/4"
Inside Dimensions: 44" x 24 3/4" x 4"